One common effect of misinterpretation for children with High-Functioning Autism (HFA) and Asperger’s (AS) is the development of distrust in others (perhaps even mild paranoia). This is largely due to impaired Theory of Mind skills in the cognitive profile of these young people. A “theory of mind” is the ability that we all have in order to make sense of the world we live in. Every person’s thoughts, knowledge, beliefs and desires make up his or her own unique theory of mind. Kids on the autism spectrum have some difficulties conceptualizing and appreciating the thoughts and feelings of others. It’s this “mind-blindness” that makes it difficult for these young people to be able to relate to - and understand - the behaviors of others. By failing to account for other’s perspectives, kids on the autism spectrum tend to misinterpret their messages. Mind-blindness also means the HFA or AS child has difficulty in distinguishing whether someone's actions are intentional or accidental. “Typical” (i.e., non-autistic) kids will know from the context, body language, and character of the other person involved that the intent was not to cause distress or injury. But, children on the autism spectrum often focus primarily on the act and the consequences (e.g., “He bumped into me and it hurt, so it was intentional”), whereas most typical children would consider the circumstances (e.g., “He was running, tripped, and accidentally fell into me”). With HFA and AS children, there may need to be training in checking the evidence before over-reacting to the event and/or person in question. This training is called “attribution retraining.” The “mind-blind” youngster often blames others exclusively and tends not to consider his or her own contribution – or conversely, the youngster can excessively blame him/herself for events. One aspect of HFA and AS is a tendency for some children to adopt an attitude of arrogance where the perceived focus-of-control is external. When the “special needs” child believes he was the victim of some form of injustice, the “perpetrator” may be held responsible and become the target for retribution or punishment. Kids on the spectrum have considerable difficulty accepting that they themselves have contributed to the event. However, the opposite can occur when the child has extremely low self-esteem and feels personally responsible, which results in feelings of anxiety and guilt. In addition, kids on the spectrum often have a strong sense of what is right and wrong – and may exhibit a striking reaction if others violate the social “laws.” The youngster may be notorious as the class “policeman,” dispensing justice but not realizing what is within his or her authority. 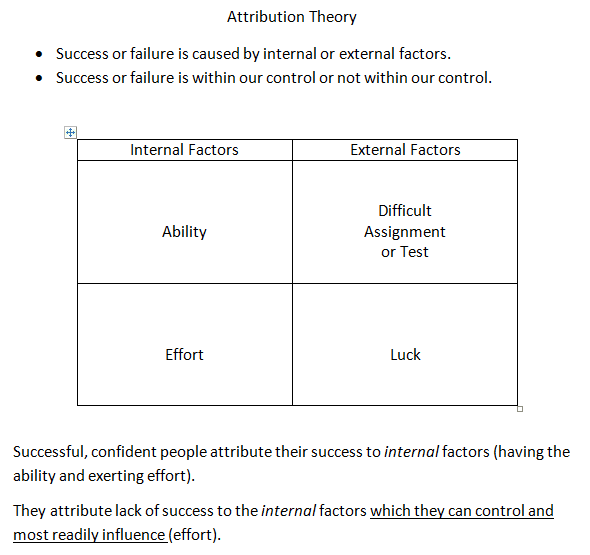 Attribution retraining involves establishing the reality of the situation, the various participants' contributions to an incident, and determining how the HFA or AS child can change his/her perception and response. A part of social-skills training for your HFA or AS child will revolve around how he “attributes” his success, and will likely require some attribution retraining to take place. This is when you retrain your child to think about his success as something he actively influences, not something of which he is a victim. Children don’t have any control over luck or task difficulty, and ability is gained through gaining knowledge and skills. Thus, the only aspect that children can directly influence on a regular basis is their effort. This is where attribution retraining takes place. When a child attributes her success or failure to something outside her effort, it’s the parents’ opportunity to redirect her (i.e., attribution retraining). 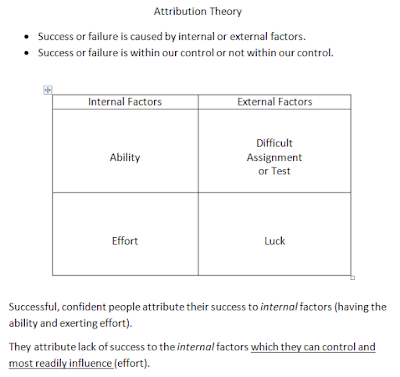 The child who adopts an effort-based belief gains an “internal locus of control” (i.e., believes she is in control of circumstances) and subsequently feels empowered. The child comes to believe that she has enough ability that – with effort – she can be successful.